We’ll pack a picnic for you! 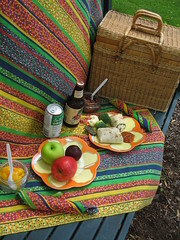 Our Picnic Special was so popular in 2006 that we offered it again this year. We tailor your picnic so you are certain to enjoy it. Then it is packed in your choice of a picnic basket or backpacks. The retro tablecloth and napkins will cause you to remember the 70’s (if you are old enough) OR pictures from the 70’s (if you are younger). The picnic is complimentary with a two night stay at the inn but there have been requests to enjoy the picnic with a single night stay so that is also an option; the cost is $45. There are so many great picnicking sites in our area and we’ve created a folder of information about them to take with you. Some guests have chosen to eat their picnic on our back deck and said it was the best picnic they ever had! If you are biking the Interurban Trail (just 3 blocks from the inn), you might prefer to have your picnic packed in individual backpacks. No problem! Just let us know your preferences. Wave the magic wand and imagine yourself as Alfred Lunt or Lynn Fontanne; act your parts in earnest in the spirit of Lunt and Fontanne whose passion for excellence and commitment to the art of live theatre was legendary. Now transport yourself to their longstanding summer residence in Genesee Deport, just 30 miles from Milwaukee, 55 miles from Port Washington. For more information about this National Historic Landmark, log onto www.tenchimneys.org or call 262-968-4110. Tours are available rain or shine May 1st through Novemeber 10th, Tuesday through Saturday. Over our eleven plus years as innkeepers, we have often heard “…..our friends (or a family member) stayed with you and told us about the Port Washington Inn….” It is, of course, music to our ears! Behind the scenes we work very hard to have every detail in place for each guest’s stay. We also try our best to be flexible and accommodating of special needs and to be helpful with information about the area. “Though we’ve both traveled extensively, and stayed in some beautiful places throughout the world, this was our first experience staying at a bed & breakfast. It will be the first of many, thanks to the wonderful experience we had at the Port Washington Inn. We easily chose our suite and booked our stay through their web site. They were responsive and friendly to our inquiries, and answered every question we had. I have some unique travel problems due to my height and health, and they made all the arrangements smooth as silk. The inn itself, a 100+ yr old home just three blocks from Lake Michigan, is a fabulous place. Dave & Rita, the owners, have restored it beautifully, with modern conveniences mixed seamlessly with traditional elegance. But as nice as the place is, the people are even better. When our plans changed mid-trip, they arranged for an early arrival and went far above and beyond to greet us and meet our needs. Prior to the trip, I had heard the ‘breakfast’ part of b&b described as everything from continental to gourmet. The meals here certainly fell into the latter category, with unique, healthful and delicious menus each morning. Fresh fruits, outstanding baked goods…I can’t say enough good things about it. I’d have paid for a couple night’s stay just to hang around Rita’s kitchen and steal a couple recipes! We stayed five nights at the PWI, and loved every moment. We had a bit of stress in our travels to Wisconsin, but it went away as soon as we arrived at this tranquil spot. Dave & Rita are incredibly friendly, warm and hospitable, without ever being intrusive. The perfect hosts.